Why is it a “Must See”? Writer-director Ana Lily Amirpour’s stunning debut, produced by Elijah Wood, follows the experiences of a small Iranian town haunted by a vampiric presence who’s just as lonely as the other locals. Shot in gorgeously expressionistic black-and-white and fusing multiple genres into a thoroughly original whole, Amirpour has crafted a beguiling, cryptic and often surprisingly funny look at personal desire that creeps up on you with the nimble powers of its supernatural focus. There’s no doubting the plot specifics that allow “A Girl Walks Home Alone at Night” to comment on the strict dimensions of Iranian society — its treatment of women and imbalance of wealth chief among them — but it elevates these ingredients to an abstract plane. By its end, “A Girl Walks Home Alone at Night” uses its tangible metaphor to reject that very sentiment and transcend the restrictions of its dark milieu. Why is it a “Must See”? “Foxcatcher” finds Miller reverting to “Capote” territory with an icy narrative largely built around performances riddled with darker themes. As “Moneyball” celebrated the delicate art of athletic management, “Foxcatcher” functions like its evil twin, exploring the capacity of the profession to mess with its practitioners’ heads. Millionaire philanthropist John du Pont (Steve Carell), an heir to the du Pont family fortune, took in Olympic gold champion wrestlers Dave Schultz (Mark Ruffalo, low key and likable) and his brother, Mark (Channing Tatum), also an Olympic gold winner. Taking its cues from Mark Schultz’s autobiography, “Foxcatcher” recounts du Pont’s strange obsession with financing the brothers’ career and eventually becoming a major wrestling sponsor even as he exhibited continuing signs of instability. Though anchored by an affecting and sullen turn by Channing Tatum, the movie derives its primary discomfiting power from Steve Carell in a revelatory performance as a monster of American wealth. Why is it a “Must See”? James Marsh’s Stephen Hawking biopic tells the story of the famed physicist’s relationship with his wife as he struggles to stay active in face of his motor neuron disease. Viewers looking for a film that pays equal attention to his ground-breaking theories as it does his physical struggle should prepare to be disappointed. Instead, “The Theory of Everything” functions as a standard inspirational tearjerker that succeeds in depicting the heart-wrenching perseverance of Jane and Stephen Hawking’s marriage. 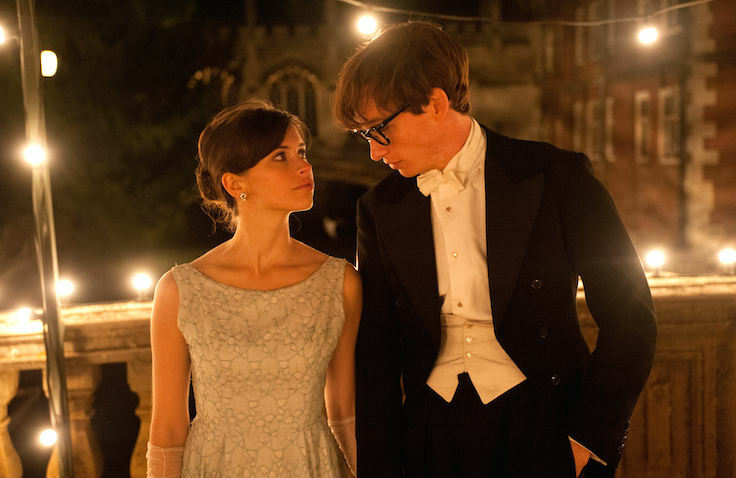 Eddie Redmayne and Felicity Jones shine as the two leads, each giving what are sure to be breakthrough performances. Why is it a “Must See”? The movies love to remind us that brilliant minds are often the most tortured. Far be it from Morten Tyldum to suggest any differently in “The Imitation Game,” a World War II procedural detailing the efforts of cryptanalyst Alan Turing and his mathematically-inclined underlings to decrypt the Nazis’ famed Enigma machine and turn the tides in England’s favor. As played by Benedict Cumberbatch, Turing is a genius in the “The Social Network” and “A Beautiful Mind” mold: brilliant but utterly lacking interpersonal skills, with an added dash of Drax the Destroyer’s literal-minded humorlessness. Perpetually stone-faced, he’s frequently lost in thought at the expense of those trying to reach him on even the most basic level; it’s to the movie’s credit that there’s no hokey attempt at visualizing his brilliance via superimposed swirls and flashes of light, as is often done in films of this sort. Why is it a “Must See”? Australian director Jennifer Kent’s feature debut “The Babadook” incorporates flickering lightbulbs, a mysterious basement and shrieking children from lesser films to create something that’s compelling even when it’s not disturbing on a primordial level. Amelia (Essie Davis) is a nursing home worker and single mom raising Sam (Noah Wiseman), her monsters-obsessed son. One day Amelia reads a book entitled “The Babadook” to Sam, and before they know it, the story from it becomes reality–is it paranormal? Or is it psychological? The Babadook” isn’t a transcendent horror film–but its ability to handle and manipulate the conventional tropes apparent in so many of its peers makes it a satisfying ride. Why is it a “Must See”? Jon Stewart may be best known as one of the finest satirists on television, but his directorial debut “Rosewater” magnifies another tendency lurking beneath the jokes: a sincere desire to demystify international problems and celebrate efforts to solve them. It’s so committed to a good-natured attitude about the power of perseverance that the many shortcomings register as inoffensively well-intentioned rather than exclusively shallow. Imagine a rousing “Daily Show” episode without the jokes. “Rosewater” is lacking in sophistication, but its attitude is infectious. Why is it a “Must See”? This film draws back the Iron Curtain and exposes what life was like in cold war Russia. It’s a rare glimpse, and one that shows how sports are inexplicably rooted in a nation’s political and cultural makeup. Why is it a “Must See”? Watch industry mainstays Minnie Driver and Danny Glover act under writer/director Prince-Bythewood (“Love and Basketball”). It’s a coming-of-age as well as a love story, and it focuses on the music industry — protagonist Noni is a rising superstar of popular music.